We get it. Photoshop is a huge factor in your work. Much of your design time is spent there and you know the tool inside out. You’ve probably wondered what it would be like if you could just create your own assets in Photoshop and use them to build a prototype in Justinmind. Well, we’ve got good news for you – our new update lets you do exactly that. Our Android UI kit also got a revamp – Android Material Design 2.0 now brings you a new Android widget library with a fresh look and boosted responsiveness. What’s more is that components from this library can now also be conveniently shared between mobile and tablet display prototypes. All in all, these changes will make your Android prototyping experience a breeze. But that’s not all. Justinmind 8.7 also boasts a new native mobile app feature. You know what it feels like – you’ve spent weeks at the grindstone designing your prototype and there’s one fantasy burning in your mind as you reach the end: “What if I could turn this prototype into a real app, right now?” Well look no further. Justinmind 8.7 lets you do exactly that by generating native applications for iOS and Android. Take a look at all the latest features below. Most of the graphic design for a prototype is done using Photoshop. The reason for this is that designers are experts at what they do – designing. So wouldn’t it be great if you could have greater control over all the little details behind a prototype? At Justinmind, we know how important unique customization is to the design process. 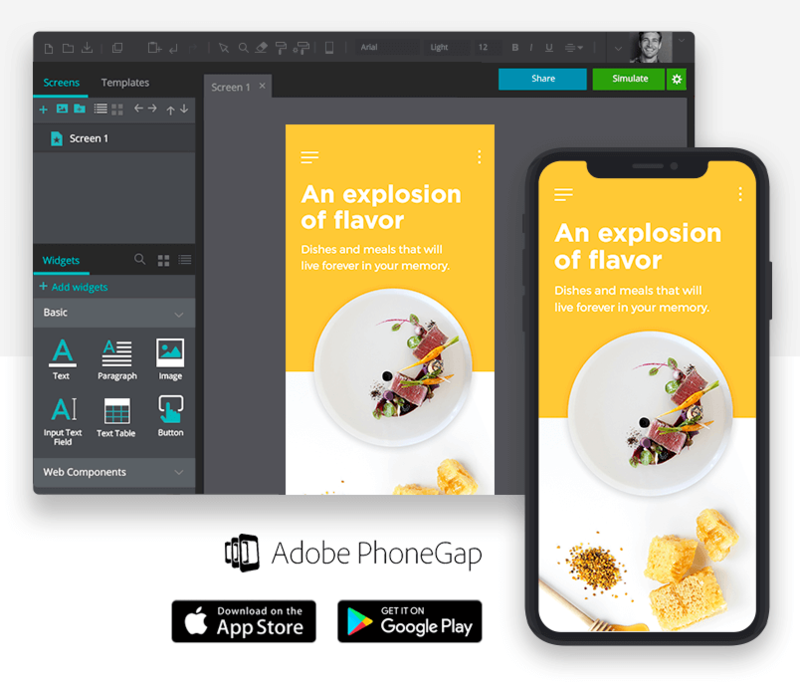 That’s why our latest release lets you create your own assets more easily in Photoshop, meaning you can really enjoy the best of both worlds – you can control every minute detail of the graphical design while also creating a fully functioning application prototype. Gone are the days where you had to just make do with exporting images into Justinmind – our new version allows you to convert any layer from your Photoshop files into components within the widget library. This means you can turn images or text into usable components within the widget library and resize them as you want, store them for use in another project, or even edit the text. All this saves you time and gives you greater control over how your prototype will look. Get your instructions for how to use the script here. Android Material Design 2.0. It’s Android prototyping but with an added edge. Our latest update includes new UI assets such as buttons, bars, menus, tabs and screens. Everything has a cleaner, more minimalist look with lots of white space, plenty of rounded corners, and bold colors have been dropped in favor of pastel. And if you’ve ever seen a widget for a mobile device that you wish you could use for a tablet (or vice versa), now you can in Justinmind 8.7. With the new update, both the mobile and and tablet widget elements have been fused into a single library, with components that re-adjust to the screen size of the new device. In addition to this you’ll also notice a big step up in responsiveness. Now when you drag a component from the widget element to the prototype device, all you have to do is drop it on top and voilà – it automatically resizes to fit the device screen. Justinmind 8.7 gives you the ability to generate a native application from your finished prototype. To convert your prototype, you just need to go to File > Export to native app. This will upload a zip file to Adobe PhoneGap. Your app can now be installed on a mobile device or uploaded to the iOS App Store or the Android Play Store. In addition to being able to convert your shiny new prototype, you can also add in a display icon for your app. To do this, open the Simulation Settings by clicking the gear icon next to the Simulate button. Converting your prototype to a native application gives you the ability to create a real app that you can test out and share, in little over a minute. How cool is that?